Do you struggle with the removal of stubborn smears, water streaks and dirt build-ups from your windows? Do they cost you too much elbow grease and you don't want to take part in this chore? This activity will no longer consume a lot of your time and energy! The specialists of window cleaning in Hornsey Rise will help you out! You will be able to use your free time as it fits you – the trained and trustworthy team members will take care of the washing and scrubbing. We offer impeccable cleaning services for all types of windows. Read further and find out more about the different advantages you can have. We also provide our professional services in nearby areas: Upper Holloway, Holloway Road, Archway, Tufnell Park, Crouch End. With our competence and technical expertise, you can count on us for domestic and commercial window cleaning. Your property will look pristine after the services, it doesn't matter what kind of windows you have. We clean single, double or sash windows, French doors, bay windows and patio doors. In addition, we clean skylights, garden windows and conservatories. In other words, you can rely on us for thorough cleaning of your windows, including frames and ledges. We provide high quality window cleaning by using advanced equipment. We provide gleaming and spotless look for your glass surfaces, skylights and greenhouses with water-fed cleaning system and high pressure cleaning. The poles we use are attached to water supply devices in our vans, thus eliminating the risk of damage to the exterior of your home or office. Plus, we use completely safe rope access equipment to clean glasses on tall buildings. You can profit from these techniques now – phone us on 020 3746 3113! With our experience and workmanship, the great look of your property will be achieved quickly – the specialists of commercial window cleaning will manage with this matter. 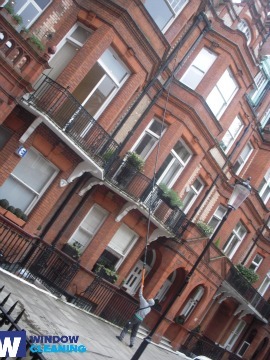 We utilise water-fed extension pole system for fast and well organised window cleaning, up to the fourth floor. For office buildings taller than that, we use modern rope access methods. With these appliances, we can reach the highest glass panes, even on the the highest buildings London is known for. From small shops to towering business scrapers, we assure you top-notch services – book, now! The specialists of window cleaning in Hornsey Rise will revive your home. We deliver excellent window cleaning services in Hornsey Rise. Our procedure includes water fed extension pole system and also high-pressure cleaning. We keep your health and safety with non-toxic cleaning solutions and purified water. Be one of our satisfied customers – dial 020 3746 3113 and get in touch with our customer care. You can also request our services on-site – just fill in our special form or use our chat facility.